even need to read your arguments” school. This entry was posted in Bad Logic, Cantor Crankery on October 28, 2009 by markcc. One thing that I wanted to do when writing about Chaos is take a bit of time to really home in on each of the basic properties of chaos, and take a more detailed look at what they mean. The phrase “sensitivity to initial conditions” is actually a fairly poor description of what we really want to say about chaotic systems. Lots of things are sensitive to initial conditions, but are definitely not chaotic. Before I get into it, I want to explain why I’m obsessing over this condition. It is, in many ways, the least important condition of chaos! But here I am obsessing over it. As I said in the first post in the series, it’s the most widely known property of chaos. But I hate the way that it’s usually described. It’s just wrong. What chaos means by sensitivity to initial conditions is really quite different from the more general concept of sensitivity to initial conditions. To illustrate, I need to get a bit formal, and really define “sensitivity to initial conditions”. To start, we’ve got a dynamical system, which we’ll call f. To give us a way of talking about “differences”, we’ll establish a measure on f. Without going into full detail, a measure is a function which maps each point x in the phase space of f to a real number, and which has the property that points that are close together in f have measure values which are close together. Given two points x and y in the phase space of f, the distance between those points is the absolute value of the difference of their measures, . So, we’ve got our dynamical system, with a measure over it for defining distances. One more bit of notation, and we’ll be ready to get to the important part. When we start our system at an initial point , we’ll write it . Now – reading that, a naive understanding would be that the diff(T) increases monotonically as T increases – that is, that for any two values and , if with measure . And for our non-chaotic system, we’ll use , with . Think about arbitrarily small differences starting values. In the quadratic equation, even if you start off with a miniscule difference – starting at v0=1.00001 and v1=1.00002 – you’ll get a divergence. They’ll start off very close together – after 10 steps, they only differ by 0.1. But they rapidly start to diverge. After 15 steps, they differ by about 0.5. By 16 steps, they differ by about 1.8; by 20 steps, they differ by about 1.2×109! That’s clearly a huge sensitivity to initial conditions – an initial difference of 1×10-5, and in just 20 steps, their difference is measured in billions. Pick any arbitrarily large number that you want, and if you scan far enough out, you’ll get a difference bigger than it. But there’s nothing chaotic about it – it’s just an incredibly rapidly growing curve! In contrast, they logistic curve is amazing. Look far enough out, and you can find a point in time where the difference in measure between starting at 0.00001 and 0.00002 is as large as you could possibly want; but also, look far enough out past that divergence point, and you’ll find a point in time where the difference is as small as you could possible want! The measure values of systems starting at x and y will sometimes be close together, and sometimes far apart. They’ll continually vary – sometimes getting closer together, sometimes getting farther apart. At some point in time, they’ll be arbitrarily far apart. At other times, they’ll be arbitrarily close together. That’s a major hallmark of chaos. It’s not just that given arbitrarily close together starting points, they’ll eventually be far apart. That’s not chaotic. It’s that they’ll be far apart at some times, and close together at other times. Chaos encompasses the so-called butterfly effect: a butterfly flapping its wings in the amazon could cause an ice age a thousand years later. But it also encompasses the sterile elephant effect: a herd of a million rampaging giant elephants crushing a forest could end up having virtually no effect at all a thousand years later. That’s the fascination of chaotic systems. They’re completely deterministic, and yet completely unpredictable. What makes them so amazing is how they’re a combination of incredibly simplicity and incredible complexity. How many systems can you think of that are really much simpler to define that the logistic map? But how many have outcomes that are harder to predict? This entry was posted in Chaos on October 26, 2009 by markcc. Let’s look at one of the classic chaos examples, which demonstrates just how simple a chaotic system can be. It really doesn’t take much at all to push a system from being nice and smoothly predictable to being completely crazy. 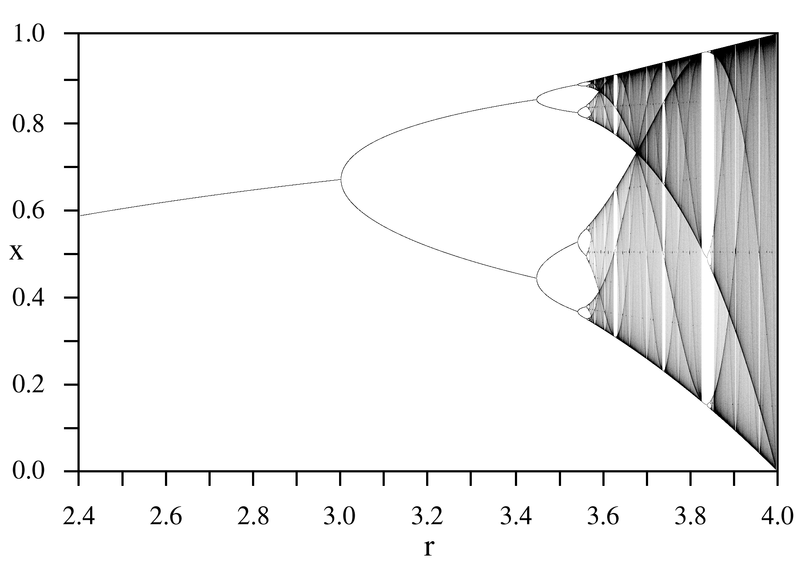 This example comes from mathematical biology, and it generates a graph commonly known as the logistical map. The question behind the graph is, how can I predict what the stable population of a particular species will be over time? If there was an unlimited amount of food, and there were no predators, then it would be pretty easy. You’d have a pretty straightforward exponential growth curve. You’d have a constant, R, which is the growth rate. R would be determined by two factors: the rate of reproduction, and the rate of death from old age. With that number, you could put together a simple exponential curve – and presto, you’d have an accurate description of the population over time. But reality isn’t that simple. There’s a finite amount of resources – that is, a finite amount of food for for your population to consume. So there’s a maximum number of individuals that could possibly survive – if you get more than that, some will die until the population shrinks below that maximum threshold. Plus, there are factors like predators and disease, which reduce the available population of reproducing individuals. The growth rate only considers “How many children will be generated per member of the population?”; predators cull the population, which effectively reduces the growth rate. But it’s not a straightforward relationship: the number of individuals that will be consumed by predators and disease is related to the size of the population! Modeling this reasonably well turns out to be really simple. You take the maximum population based on resources, Pmax. You then describe the population at any given point in time as a population ratio: a fraction of Pmax. So if your environment could sustain one million individuals, and the population is really 500,000, then you’d describe the population ratio as 1/2. That simple equation isn’t perfect, but it’s results are impressively close to accurate. It’s good enough to be very useful for studying population growth. So, what happens when you look at the behavior of that function as you vary R? You find that below a certain threshold value, it falls to zero. Cross that threshold, and you get a nice increasing curve, which is roughly what you’d expect. Up until you hit R=3. Then it splits, and you get an oscillation between two different values. If you keep increasing R, it will split again – your population will oscillate between 4 different values. A bit farther, and it will split again, to eight values. And then things start getting really wacky – because the curves converge on one another, and even start to overlap: you’ve reached chaos territory. On a graph of the function, at that point, the graph becomes a black blur, and things become almost completely unpredictable. It looks like the beautiful diagram at the top of this post that I copied from wikipedia (it’s much more detailed then anything I could create on my own). But here’s where it gets really amazing. For this population curve, the SSSF turns out to about 4.669. What’s the SSSF for the Mandelbrot set? 4.669. In fact, the SSSF for nearly all bifurcating systems that we see, and their related fractals, is virtually always exactly 4.669. There’s a basic structure which underlies all systems of this sort. What’s this sort? Basically, it’s a dynamical system with a quadratic maximum. In other words, if you look at the recurrence relation for the dynamical system, it’s got a quadratic factor, and it’s got a maximum value. The equation for our population system can be written: P(t+1) = R×P(t)-P(t)2, which is obviously quadratic, and it will always produce a value between zero and one, so it’s got a fixed maximum value, and Pick any chaotic dynamical system with a quadratic maximum, and you’ll find this constant in it. Any dynamical system with those properties will have a recurrence structure with a scaling factor of 4.669. That number, 4.669 is called the Feigenbaum constant, after Mitchell Fiegenbaum, who first discovered it. Most people believe that it’s a transcendental number, but no one is sure! We’re not really sure of quite where the number comes from, which makes it difficult to determine whether or not it’s really transcendental! But it’s damned useful. By knowing that a system is subject to recurrence at a rate determined by Feigenbaum’s constant, we know exactly when that system will become chaotic. We don’t need to continue to observe it as it scales up to see when the system will go chaotic – we can predict exactly when it will happen just by virtue of the structure of the system. Feigenbaum’s constant predictably tell us when a system will become unpredictable. This entry was posted in Chaos, Fractals, goodmath on October 20, 2009 by markcc. me about “superstition” the other day. number bugs you so much, move. might be glad for that yourself one day. moron role, so interviews with me are often not aired. This entry was posted in Debunking Creationism, Numbers on October 19, 2009 by markcc. 2 pounds chicken breasts, bone in. 1 chipotle pepper in adobo sauce, finely minced. 1 large dried ancho chili pepper. 1 dried serrano chile pepper. 2 ounces dark chocolate, chopped. 1 dozen corn tortillas, lightly toasted. Brown them well on both sides, then remove. let them cook for about 3 minutes. Add the can of tomatoes, the cumin, the cinammon, and the coriander. the the chicken is covered. Let it simmer on medium-low heat for about 20 minutes. aside and let it cool. it simmer for another 10 minutes. of chicken stock, and simmer it for half an hour. them in. Let it cook until the sauce starts to thicken. stir until it’s melted and well-blended in. Taste the sauce, and add salt, black pepper, and sugar to taste. Toast the tortillas lightly until they’re softened. chicken, roll it, and then put it into a baking dish. them nicely coated, but not drowned. Shred cheese over the top of the sauce. Bake the casserole with the tortillas for 30 minutes at 350 degrees. Serve it with a nice mexican rice and beans. This entry was posted in Recipes and tagged recipe on October 17, 2009 by markcc. Humans not yet Perfect? There must be a god involved! The basic idea of it? The fact that we are not perfect means that we must have been created by a perfect God. Is it me, or is there something a bit weird about that argument? This entry was posted in Debunking Creationism on October 15, 2009 by markcc. Lately, friday’s have just been too busy for me to get around to posting a recipe. So I decided to switch my recipe posts to saturday. I’ll try to be reliable about posting a recipe every saturday. I tried making homemade salsa for the first time about about two months ago. Once I’d made a batch of homemade, that was pretty much the end of buying salsa. It’s really easy to make, and fresh is just so much better than anything out of a jar. When it takes just five minutes of cooking to make, there’s just no reason to pay someone else for a jar of something that’s not nearly as good. This recipe isn’t much to look at. It’s a tomato salsa – it looks pretty much like a salsa you’d buy in a store, except that it’s a paler pink, because the tomatoes weren’t cooked down. But in terms of taste, it’s an absolute knockout. The original version of this recipe came from Mark Miller’s Salsa cookbook. , which is a fantastic little book. But since I first made it, I’ve made enough changes that it’s really a very different salsa. Obviously, I like mine better :-). This entry was posted in Recipes on October 10, 2009 by markcc. mocking the astonishing stupidity of the Conservapedia folks. “requires conservative principles to reduce and eliminate”. that I’ve seen so far is one incredibly important point. what they want it to say. This entry was posted in Chatter, fundamentalism on October 8, 2009 by markcc. get to hear his beautiful playing. of a selection of their old songs. This is one of the tracks that they chose. Kelly’s keyboards, and Rothery’s electric guitar. increase the emotional impact of the song. It’s really quite impressive. Marillion, they started off as a Genesis sound-alike, but grew into their own sound. sound is brilliant – it’s worth getting over the vocals to enjoy them. spectrum. Their compositional style is much more minimalistic than a lot of others. But it’s beautiful stuff. Highly recommended. give them a try. It’s pure brilliance. This entry was posted in Music and tagged lists, music on October 2, 2009 by markcc. with a lot of readers. I’m going to mock a very well-known atheist. No, not PZ. thinks religion is. All well and good. screwed up. And I’ve got to call him on it. This entry was posted in Bad Physics on October 2, 2009 by markcc.